WHAT IS NATIONALISM [Filipino Nationalism]? Jose Rizal - Reformist or Revolutionary? The Purpose of Our Past, Why Study (Our) History? 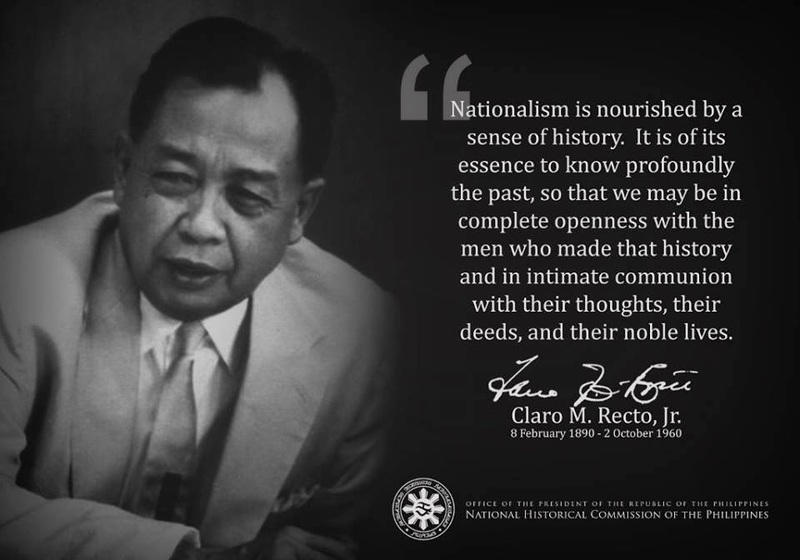 We should always find it refreshing to review our history, even just bits and pieces of it, and to appreciate that among our recognized national heroes were reformists and revolutionaries who, in common, had social consciousness and concern about their generation and of future generations of Filipinos; and thus acted, in their own small way, towards education - for attaining a national sense of community/unity, characterized by mutual help and protection; all indications of the beginning of a sense of nationhood. There are among us Filipinos, more aptly described as Americanized Filipinos, and foreigners arrogantly and impatiently telling us to "move on," "forget history, past is past," or claim that nationalism is anachronistic and for the birds. Obviously not realizing that in this age of so-called globalization, nationalism is actually on the rise in much of the world --even among the ultra-nationalists (imperialists). Nationalism is the main impediment to globalization, aka neocolonialism. We should tell them, especially such fellow Filipinos unaware of our "damaged culture," that we can not move forward with all the heavy cultural baggage we have, which we have to look into, sort out and dispose of. It is only after disposing all those historical myths, lies and ignorance we absorbed in our minds and hearts can we understand how: we became what we are today; can we decide on/plan for our course of action/direction and can we decisively act to reach our national destination: national sovereignty and the common good. Here-under are two short extracts about the "La Liga Filipina." One from the historical book by Renato Constantino and another, from Teodoro Agoncillo. When upon his return to the Philippines in July, 1892, Rizal organized the La Liga Filipina, this constituted a forward step in the reformist ideas of the times in the sense that the new group sought to involve the people directly in the reform movement. Many elements of society who were anxious for change were attracted to the Liga, among them, Andres Bonifacio who became one of the founders of the organization. Study and application of reforms. As Rizal envisioned it, the league was to be a sort of mutual aid and self-help society dispensing scholarship funds and legal aid, loaning capital and setting up cooperatives. These were innocent, even naive objectives that could hardly alleviate the social ills of those times, but the Spanish authorities were so alarmed that they arrested Rizal on July 6, 1892, a scant four days after the Liga was organized. With Rizal deported to Dapitan, the Liga became inactive until, through the efforts of Domingo Franco and Andres Bonifacio, it was reorganized. Apolinario Mabini became the secretary of the Supreme Council. Upon his suggestion, the organization decided to declare its support for La Solidaridad and the reforms it advocated, raise funds for the paper, and defray the expenses of deputies advocating reforms for the country before the Spanish Cortes. At first the Liga was quite active. Bonifacio in particular exerted great efforts to organize chapters in various districts of Manila. A few months later, however, the Supreme Council of the Liga dissolved the society. The reformist leaders found out that most of the popular councils which Bonifacio had organized were no longer willing to send funds to the Madrid propagandists because, like Bonifacio, they had become convinced that peaceful agitation for reforms was futile. Afraid that the more radical rank and file members might capture the organization and unwilling to involve themselves in an enterprise which would surely invite reprisals from the authorities, the leaders of the Liga opted for dissolution. The Liga membership split into two groups: the conservatives formed the Cuerpo de Compromisarios which pledged to continue supporting the La Solidaridad while the radicals led by Bonifacio devoted themselves to a new and secret society, the Katipunan, which Bonifacio had organized on the very day Rizal was deported to Dapitan. Almost simultaneously with the introduction of Masonry in the Philippines, a civic society called La Propaganda was established. Its members, composed mostly, if not exclusively, of the middle class, contributed money to defray the expenses of the Filipino reformers in Spain who were waging a campaign to obtain political concessions from the Mother Country. The funds collected were forwarded to the Hispano-Filipino Association. In time, however, the funds of the organization were malversed, and the society passed out of existence. At this juncture, Rizal stepped into the picture and proposed the founding of another civic society. He had prepared a constitution for this society while at Hong Kong and now he thought that the time has come for concrete action. On the night of July 3, 1892, at a house in Tondo, Rizal founded and inaugurated La Liga Filipina. Elected were Ambrosio Salvador (President); Agustin de la Rosa (Fiscal); Bonifacio Arevalo (Treasurer) and Deodato Arellano (Secretary). The aims of the Liga were to be carried out through the creation of a governing body composed of the Supreme Council, the Provincial Council, and the Popular Council. The members were each to pay ten centavos as monthly dues. Each of the members was free to choose a symbolic name for himself. Shops, stores, and establishment shall be opened where the members may be accommodated move economically than elsewhere. Innocent as the society was, the Spanish authorities considered it dangerous and on the night of July 6, 1892, Rizal was secretly arrested. The following day, Governor-General Eulogio Despujol ordered Rizal's deportation to Dapitan. The Liga languished for a while, but some members continued to support it. The aims remained the same, but it was agreed that all should contribute toward the support of La Solidaridad in Spain. Domingo Franco was elected President; Deodato Arellano, Secretary-Treasurer; Isidro Francisco, Fiscal; Juan Zulueta and Timoteo Paez, members of the Supreme Council. Later on, Mabini became the Liga's Secretary. para sa pagpapahalaga ng panitikang Pilipino. ESTATUTO DE LA L. F.
1. Unir todo el A. * * * en un cuerpo compacto, vigoroso y homogéneo. 2. Proteccion mútua en todo apuro y necesidad. 3. Defensa contra toda violencia é injusticia. 4. Fomento de la instruccion, agricultura, industria y comercio. 5. Estudio y aplicacion de reformas. 1. Para poner en práctica estos fines, se crearán Cp. * C. P. * y un C.
céntimos de peso, como cuota mensual, desde el mes de su ingreso. medio para conseguir lo que el A. * mas ama en la vida. 5. En todos los actos de la vida concederá la preferencia á los otros A.
memoria los nombres simbólicos y verdaderos de todos los G. * de los C.
hagan y las pondrá inmediatamente en conocimiento de quien corresponda. no obstante, en responder á los cargos que se le puedan hacer. de sus A. * ó subordinados. comunicaciones y empresas para su eficacia, seguridad y rapidez. 1. El F. * velará porque todos cumplan con su deber. 3. Pondrá en conocimiento del C. * todo peligro ó persecusion. particulares, como tambien de los gastos. otro su visto bueno. Iguales procedimientos se seguirán cuando el T. P.
mejor le parezca, exigiéndo un recibo del depósito, que remitirá al C.
S. * por conducto del G. P. * ó directamente si lo estima conveniente. lo que se haya de hacer. 6. Ningún. A. * será juzgado sin que antes se le permita la defensa. demuestre aplicacion y grandes facultades para el trabajo y al estudio. 2. Se sostendrá al pobre A. * en su derecho contra algun poderoso. 3. Se socorrerá al A. * que haya venido á menos. puedan surtirse mas económicamente que en otra parte. sigue és, del A. * al Gp. * de éste al G. P. * ó al G. S. * y viceversa. y una de las autoridades. mision de reorganizarlos y reconstituirlos. jurado, que fallará la cuestion. conforma en la sentencia alli dictada, puede acudir en apelacion al C.
A. deben conceptuarse que las sufren y padecen todos. 1. Join all the A. * * * In a compact, powerful and smooth. 2. Mutual protection in every need and want. 3. Defense against all violence and injustice. 4. Development of instruction, agriculture, industry and commerce. 5. Study and application of reforms. 7. Each C. P. * And Cp. * Takes a different name from the town or region. 1. Pay two dollars at one time, as entry fee, and fifty cent by weight, such as monthly, from the month of admission. 3. Participate immediately and without losing time to the authorities of the C. * See everything, notice or hear that constitute a hazard to the tranquility of the L. F. * Or something that concerns her, trying to commitment to be honest, truthful and thorough in everything that tries to communicate. 4. Most absolute secrecy to outsiders, although they were parents, siblings, children, etc.., at the expense of his own life, the facts acts and decisions of its C. * And L. F. * In general, with what it means to A. * Loves most in life. 6. The A. * That no helper pudiéndolo (?) to another in case of trouble or danger,will be punished and he shall be at least the same penalty as the other has suffered. 8. Give each C. * A job, an observation, a study or a new applicant. 9. Not subject to any humiliation or treat anyone with arrogance and contempt. 2. Constantly explore ways to connect to their subordinates and them in quick communication. 4. Attend as many observations, communications and petitions will made and shall immediately notify the person concerned. 6. Give an example of subordination to the G. * Higher to be subordinates obeyed. 10. A lack of time and occasion, can work by itself and before leaving however, in answer to the charges that might come up. 12. He alone is entitled to know the real names of the A. * Or subordinates. 13. Broad powers to organize the details of the meetings,and communications companies for their efficacy, safety and speed. 14. When a C. * Can be quite large G. P. * Create othersub-C. * Appointing authorities first. Once formed, they will choose them according to regulations. 1. The F. * Shall ensure that all do their duty. 3. Shall inform the C. * Any danger or persecution. 6. You can at any occasion to examine the records and books accounting. 2. Render to P. * With G. * Strict account fees each month received, recorded by the same A. * With your passwords individuals, as well as expenses. 3. Will give a receipt and note it on the record with the same fist and donor's point all donations in excess of a weight not exceeding fifty dollars. 6. When some A. * Want to give to the L. F. * A sum of exed a fifty dollars, will deliver on deposit to any of the T. * That you see fit, ask for a receipt of deposit, to be sent to C.S. * Through G. P. * Or directly if you wish. 1. He will report at each meeting of what has been prepared, and announce what has been done. 5. Of all the establishments or held directly by members L. F. * May require lowering of the articles or services to begive it. 6. No. A. * Be tried without first defense is allowed. 1. They hold the member or his son, not having means,show application and great abilities for work and study. 2. A. It will hold the poor * In their right against any powerful. 3. It succor to A. * Unless you came. 4. We provide capital to A. * You need for an industry or agriculture. 5. It will promote the introduction of machines and new industries or needed in the country. 6. Will open stores, warehouses, establishments where A. *likely to work better economically than elsewhere. 1. To be admitted to an A. * To the L. F. * It is necessary that the applicant possess morality, good manners, not being processed justified as a thief, not player, drunkard or libertine. The applicant must claim and request an A. * Your income and what it communicated to F. * To the necessary inquiries with respect to its conduct. 2. Notwithstanding the preceding article, none will be accepted without prior vote of the C. * Satisfied the test requirements is sugeto the neophyte. 5. For fees required three-fourths of thevote of those present. 7. Ordinary time communications should get their names symbolic signing as both the recipient and the course still is, the A. * To Gp. * Of it to G. P. * Or the G. S. * And vice versa.Only in rare cases can save these formalities are not However, at any time, anywhere G. S. * Can directlyto anyone. 8. It is not necessary that all members of a C. * Be present todecisions to be valid, it is enough that is present in half and one of the authorities. 9. At critical times each C. * Should be taken as safeguarding L. F. * And if for one reason or another were dissolved desaparecieren or other, each C. * Each G. * Each A. * Take upon him mission to reorganize and reconstitute. 11. When from the A. * Each other questions arise for reasons of material interest or a personal offense, the injured or offended should go complain to P. * From the C. * Who ordered the formation of a jury, the question will fail. 12. When the A. * Note bias in the court of Cp. * And notthere forms in the sentence imposed, may appeal in the C.P. * And up to C. S. * Doing the paperwork for these cases ofgerarquia (?) in gerarquia. 13. The decisions of the court of C. S. * Do not support and appeal, for,are irrevocable. 14. It is forbidden to all A. * Of L. F. *subject to judicial and governmental authorities of all kinds matters arising between A. * Any breach in this regard, it will severest punishment. With such fraternal Therefore, all are bound to defend each other's interests A. * Commiserate and relieve the misery, because it suffers and suffers A. be conceptualized who suffer and suffer all. THE FILIPINO MIND blog contains 533 published postings you can view, as of December 20, 2012. Go to the sidebar to search Past & Related Postings, click LABEL [number in parenthesis = total of related postings]; or use the GOOGLE SEARCH at the sidebar using key words [labels, or tags] for topics of interest to you. OR click a bottom label or tag to open related topics. The postings are oftentimes long and a few readers have claimed being "burnt out." My apologies. As the selected topics are not for entertainment but to stimulate deep thought (see MISSION Statement) and hopefully to rock the boat of complacency (re MISSION). (1) Bold/Underlined words are HTML links. Click to see linked posts or articles. (2) Scroll down to end of post to read or enter Comments. Any comment sent to my personal email will be posted here. ANONYMOUS COMMENTS WILL BE IGNORED. (3).Visit my other website SCRIBD/TheFilipinoMind; or type it on GOOGLE Search.View/Free Download pdf versions of: postings, eBooks, articles (120 and growing). Or another way to access, go to the sidebar of the THE FILIPINO MIND website and click on SCRIBD. PLEASE Share! (4). Some postings and other relevant events are now featured in Google+, BMD_Facebook, BMD_Twitter and BMD_Google Buzz. (5) Translate to your own language. Go to the sidebar and Click on GOOGLE TRANSLATOR (56 languages - copy and paste sentences, paragraphs and whole articles, Google translates a whole posting in seconds, including to Filipino!!). (6). From suggestions by readers, I have added some contemporary music to provide a break. Check out bottom of posting to play Sarah Brightman, Andrea Bocelli, Sting, Chris Botti, Josh Groban, etc. (8) Forwarding the postings to relatives and friends, ESPECIALLY in the homeland, is greatly appreciated. Use emails, Twitter, Google+, Facebook, etc. below. THANKS! !